It’s that time of year again. The Sapporo Snow Festival 2019 is almost here. There is no shortage of great winter festivals in Japan, but Sapporo’s is the most popular and the most well-known internationally. 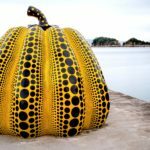 Every year, on the country’s northernmost island of Hokkaido, over 2 million visitors descend on the city for a week of spectacular snow and ice sculptures (plus a few extra days of snow slides and snowtubing at the Tsudome site). This year marks the 70th edition of the festival. The event kicks off on Jan. 31, with the sculpture exhibitions getting underway on Feb. 4 — and everything wrapping up on Feb. 11. 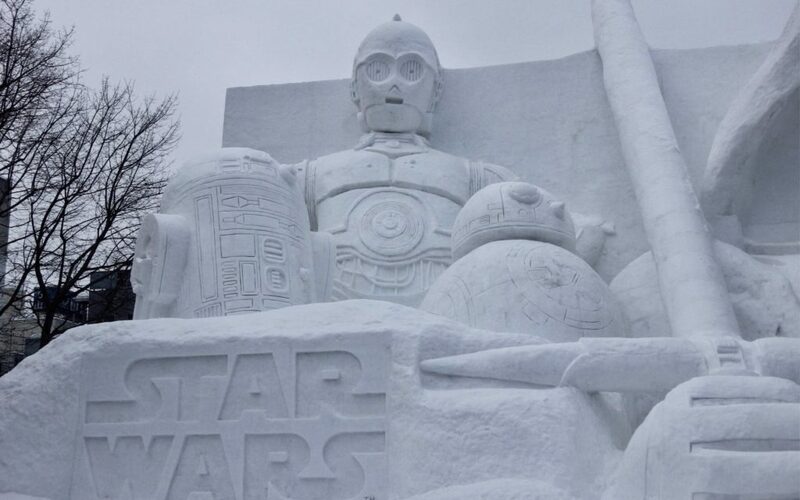 To celebrate the completion of the new Star Wars film trilogy this coming December, one of the big snow sculptures on display will again be themed to Star Wars for Japanese fans, as it was in 2017 and 2015. The droids segment of the “Snow Star Wars” sculpture at the 2017 festival. The droids C-3PO, R2-D2 and BB-8 will form the main backdrop, and there will be a segment in front that allows visitors to board a snow-sculpted version of an X-wing starfighter. This is probably the closest you’ll ever get in real life to visiting the ice planet of Hoth from The Empire Strikes Back. Maybe you’ve already got your trip booked… or maybe you’re a traveler who thrives on spontaneity. If so, it might not be too late to book a flight and hotel room. In 2017, I was able to do so affordably the week before the festival started. I even managed to snag a room next to Odori Park, so I could visit early in the morning to get pictures of the snow sculptures without the usual crowd around. Staying near Odori Park is one tip for making the most of your experience at the Sapporo Snow Festival. Here are four other practical suggestions. View from the plane as it makes its landing descent on the island of Hokkaido. So let’s say you’ve locked in your flight, maybe with a low-cost carrier like Peach or Jetstar or maybe with JAL or ANA — the latter of which does boast a fleet of Star Wars jets. 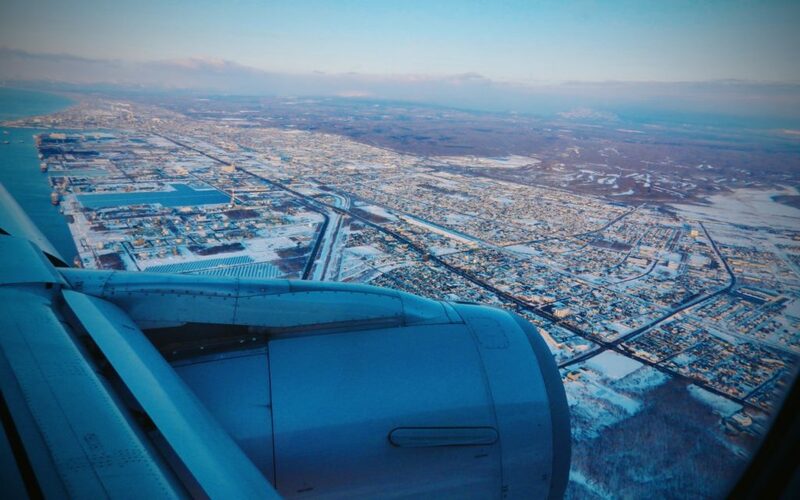 Here’s where the reality of air travel to Sapporo sets in. Beware the blizzards of February. There’s a reason they hold the festival at the snowiest time of year. Sapporo and snow go together; planes and snow don’t. Leave room in your travel budget for emergency hotel accommodations or even — worst-case scenario — a plane ticket on another airline if you can’t wait for the next available flight on yours. With 2 million festival goers, New Chitose Airport can turn into a nightmare when flights start getting delayed or cancelled. 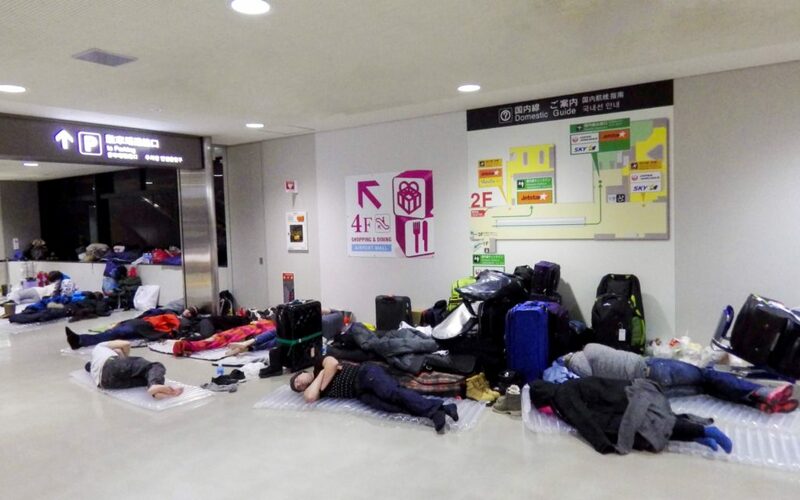 Stranded travelers sleeping in Narita International Airport the week of the Sapporo Snow Festival. The first weekend of 2019 saw 2,000 travelers stranded at said airport. Long lines at the check-in desk or security gate are not an uncommon sight during snowy conditions. If nothing else, be mentally prepared for the possibility of having flight trouble. This happened to me personally on two separate occasions. It wasn’t just an isolated incident. 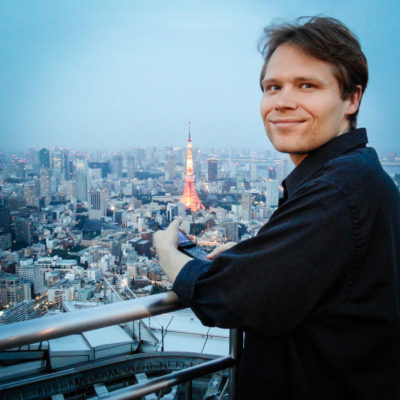 In 2017, my departing flight from Sapporo got cancelled last minute and I had to frantically find a new hotel and pay for an additional night (the airline provided a reimbursement much later). Suffice it to say, you’ll want to be ready in the event something like this happens to you. 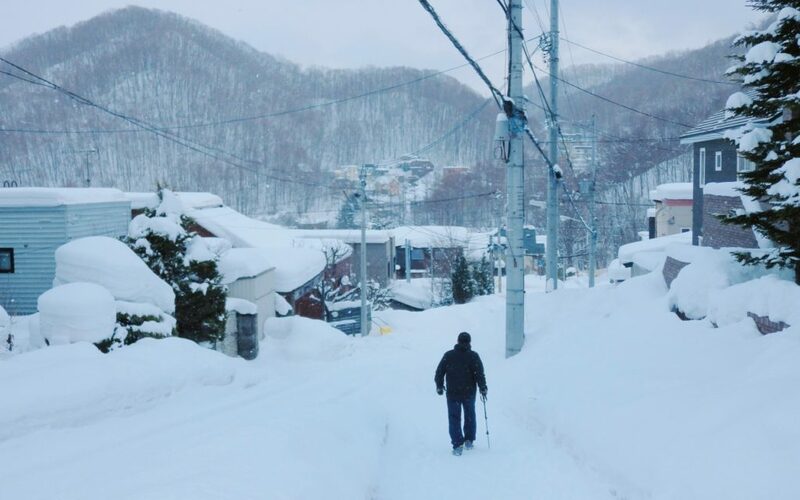 A man trudges through the snow near the Olympic Ski Jump stadium in Sapporo. It goes without saying that you’ll want to pack warm clothes for a trip to the Sapporo Snow Festival. If you’re someone like me who originally hails from a place like sunny Florida, you might be surprised at how penetrating the cold is as you’re romping through the winter wonderland of snow and ice sculptures. Break out the thermal underwear. On top of that, you’ll want to have a middle layer for insulation and a heavy jacket or coat. If you want to get some winter relief the Japanese way, you can buy some cheap, air-activated, disposable kairo (heat pads) for your pockets. Lifehack: hot cans of coffee or soup from the closest vending machine will do in a pinch. 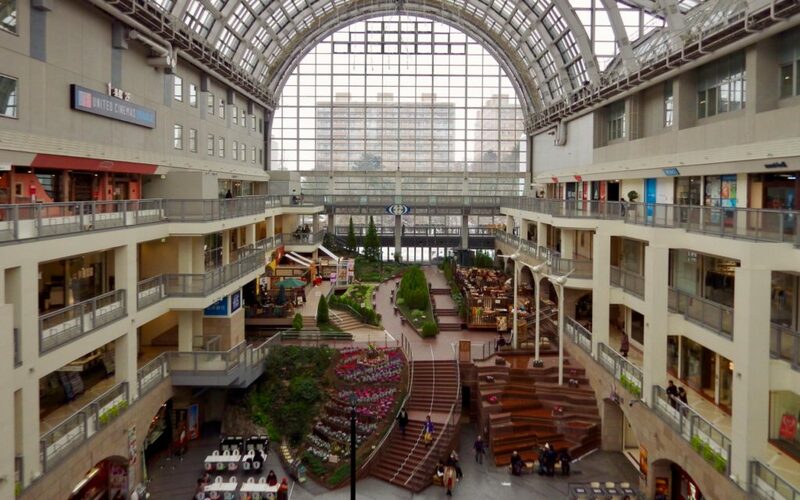 If you need to buy clothes while you’re there, you can go shopping at the Sapporo Factory mall. If you don’t have snow boots, shoes with good treads are a must — otherwise you’re liable to find yourself slipping on icy sidewalks or snowy roads. When all else fails, you can always purchase kutsu no suberidome (ice cleats). In Sapporo, these non-slip spikes should be available at most convenience stores and shops or kiosks inside train and subway stations. They’re attachable to your shoe soles and only run about ¥1,000 to ¥1,500 per pair. Presumably, you’ll want to be taking pictures of all the different snow and ice sculptures. If you’re doing that on your smartphone or tablet, it would be a good idea to bring touchscreen gloves. Even with a regular camera, gloves with thickly padded fingers can make it tricky to work the buttons and knobs. The last thing you want to be doing is taking your gloves on and off all the time as you’re trying to snap the perfect photo. 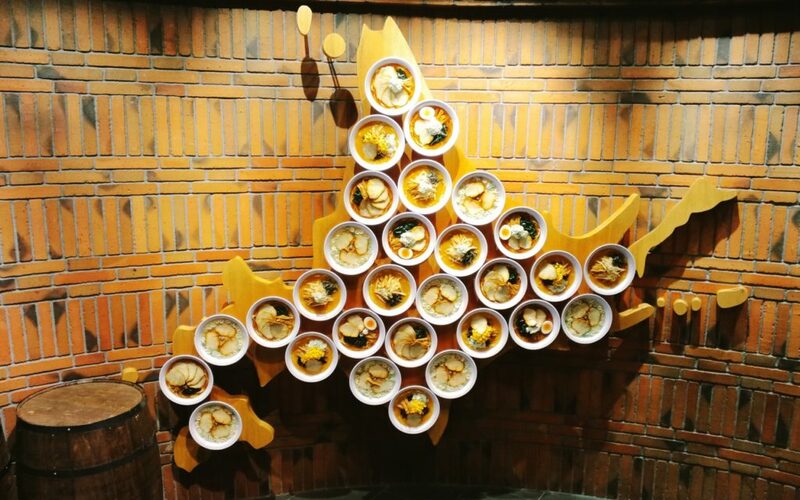 A Hokkaido map made of ramen bowls at the Hokkaido Ramen Dojo in New Chitose Airport. Sapporo is littered with ramen shops. If you want to get a hot bowl of the city’s signature miso ramen, you can pop in any random shop, but it helps to know the best options ahead of time. The famous alley of Ramen Yokocho is conveniently located near the neon-lit Susukino district, which serves as the main site for ice sculptures at the festival. Aji no Karyu is the shop where Anthony Bourdain ate, but I’m partial to Teshikaga Ramen myself. However, don’t be afraid to venture outside touristy places like Ramen Yokocho and the Sapporo Ramen Republic for noodles. There are plenty of better-reviewed local ramen shops all around town. The Sapporo section of our guide to Japan’s top three regional ramen lists Minoya, Menya Saimi and Menya Yukikaze as good standalone shops. If you’re pressed for time, you could even squeeze in a bowl at the airport in the Hokkaido Ramen Dojo. Soup curry at Okushiba Shoten. Eating outside the lunch and dinner rush will help cut down on your wait time. This is especially important for soup curry shops, which are small and command long lines. 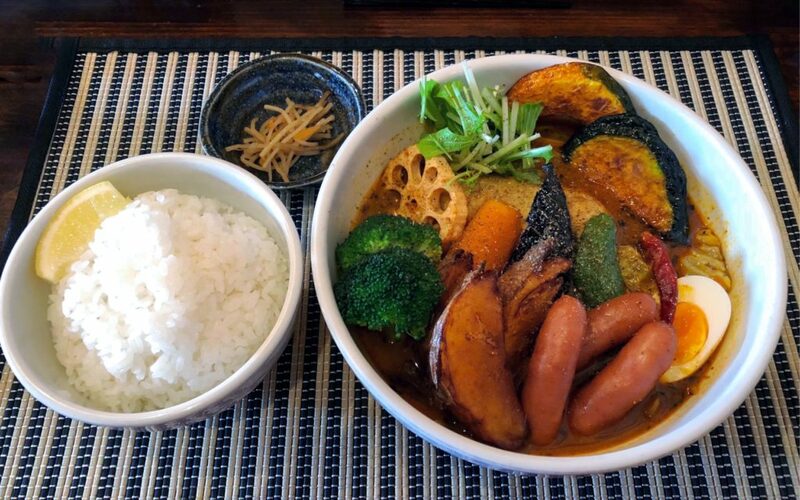 During my last festival visit, I went right at opening time — 11:30 a.m. — and the wait for soup curry at the delicious Garaku was already up to 1 ½ hours. Indeed, there were “no reservations,” as Bourdain would say. Ninety minutes is a long time to be waiting out in the cold. If you’re visiting briefly, it’s a chunk of precious trip time that you’ll never get back. By the same token, I was able to sit down for soup curry at Suage around 4:30 p.m. with no wait. 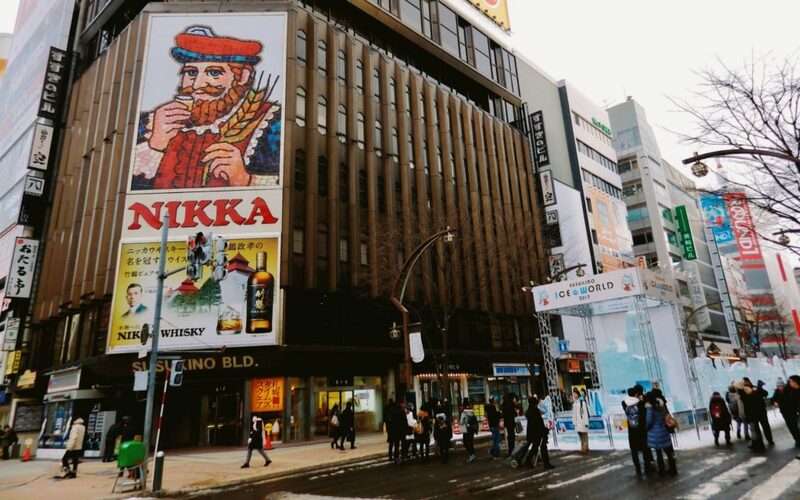 Both Garaku and Okushiba Shoten have satellite shops in Tokyo, so if it’s an option for you, you could even wait till you’re in the capital and seek out the same shops there. Don’t forget seafood. In addition to Sapporo’s Central Wholesale Market, you can get some of the best fresh fish in Japan by making a quick side trip to Otaru. If you’re jonesing for jingisukan (grilled lamb on a skillet), you can call ahead to make dining reservations at the Sapporo Beer Garden. 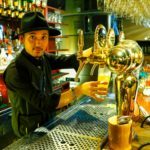 Sapporo is an amazing city with a lot to offer, whether it be exploring the Sapporo Beer Museum, shopping under the beautiful atrium of the Sapporo Factory mall or visiting Shiroi Koibito Park, where the famous Japanese cookie maker keeps its real factory churning out the delectable white-chocolate biscuits. If you want to get a bird’s-eye view of the city, we’ve got a separate article with a section on observation decks in Sapporo, including Sapporo TV Tower and the Olympic Ski Jump stadium. Remember, the snow festival is an annual event, so if you can’t fit everything into one visit, you can always do a revenge trip another year. This is especially doable if you’re living in Japan near a major city center, where you can hop on a short domestic flight. The entrance to Susukino, the main site for the festival’s display of ice sculptures. After the snow clears around the glass pyramid of Moerenuma Park and other places, Sapporo becomes a whole new city. So if you want to see a different side of it, consider visiting in one of the other three seasons, too. Spring brings cherry blossoms; summer brings greenery; fall brings colored leaves. 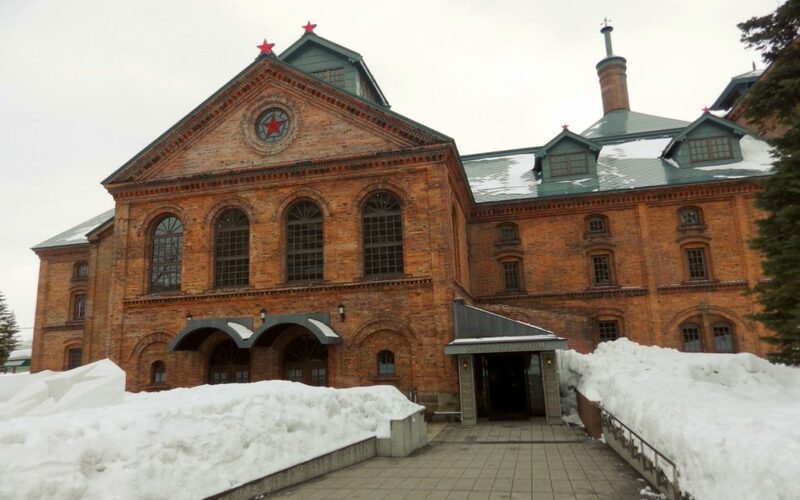 There’s really no bad time to visit Sapporo. 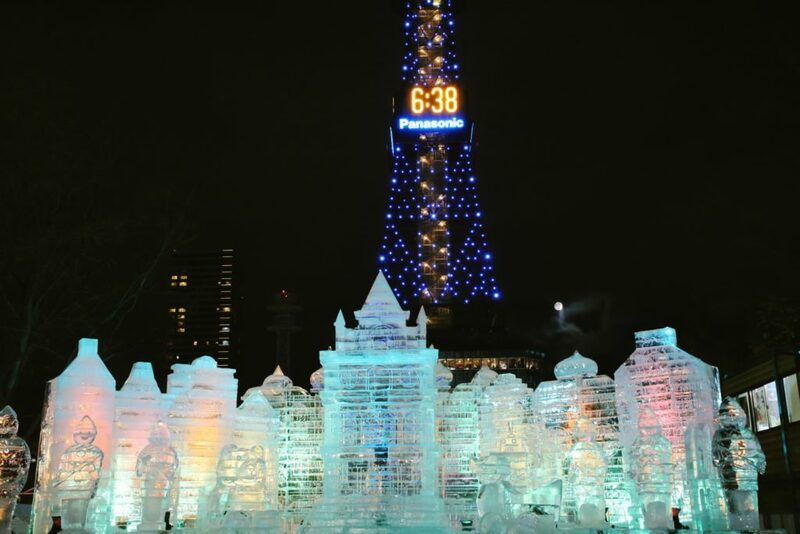 Have you been to the Sapporo Snow Festival? Do you have any good tips for getting the best out of it? Share your comments below!